Beth Short of the Ohio Attorney General’s Office leads a seminar on how nonprofit organizations can avoid becoming victims of theft. Dozens of volunteers from several area booster groups, school boards, churches, community organizations and other groups recently learned best practices for keeping their groups’ money safe. 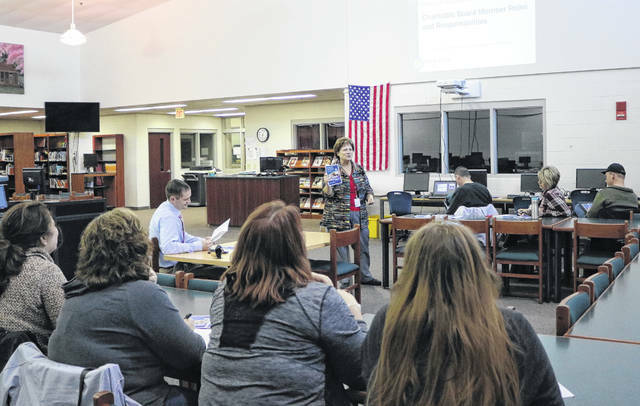 Indian Lake High School hosted a free, nonprofit training event with Beth Short of the Ohio Attorney General’s Charitable Law Section. Short offered history and expert advice for making sure the intended beneficiaries of funds get the full use of those resources. “We help good people do good things the right way,” she said. Short detailed how to avoid theft in a nonprofit by developing anti-theft procedures, including limiting use of cash, reconciling bank statements in a timely fashion, establishing reimbursement policies and requiring dual signatures. She also discuss the warning signs possible trouble including bounced checks, audit results and sudden, unexplained changes in lifestyle of employees or volunteers. She also advised developing an action plan should problems arise. For more information on avoiding theft in a nonprofit, check out www.ohioattorneygeneral.gov for weekly webinars and other resources.